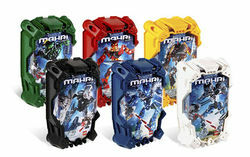 K8915 Toa Mahri Collection is a BIONICLE product collection released in 2007. It contains all of the Toa Mahri, 8910 Kongu, 8911 Jaller, 8912 Hewkii, 8913 Nuparu, 8914 Hahli, and 8915 Matoro. Facts about "K8915 Toa Mahri Collection"